A huge welcome to you! 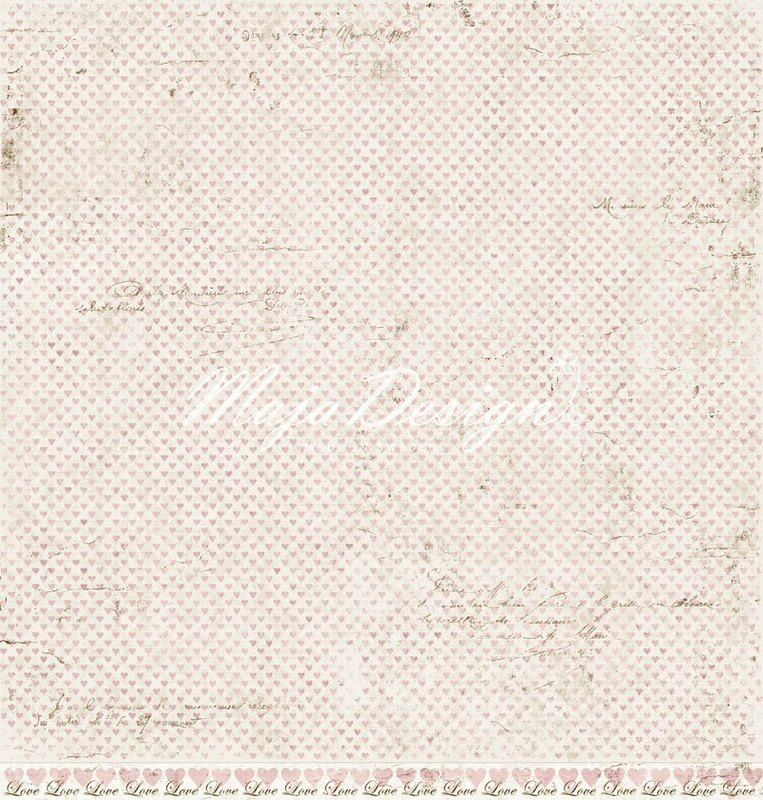 It’s Tina with you today to share my next Design Team creation. This, for me, was a layout of love. 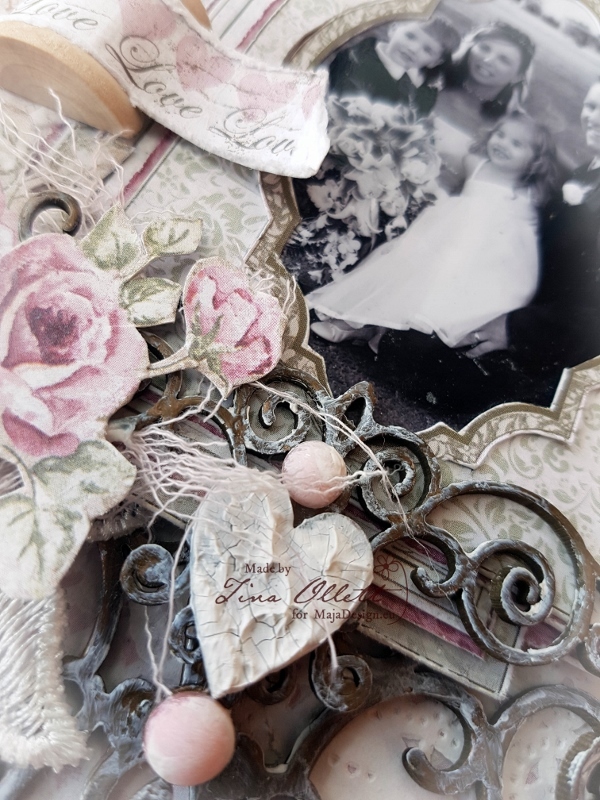 Scrapbooking for me is about the memories and sometimes the photos from the most special days of all, aren’t of the best quality but I always insist on using them no matter what. On our special day a professinal photographer was hired, but it was very unfortunate that during the development of our photos that something went horribly wrong. Due to the developing error we we did not receive a great deal of photo’s that were of a good quality or worthy of using to hang on our walls. We depended on our family and friends to help us with photo’s they had taken and this photo is one of them. We were so fortunate to have our two eldest attend our wedding. They were so excited the whole day through. My son walked me down the aisle with my Dad, something I will never forget and treasure always. I am mad for anything at present that I can fussy cut from papers. 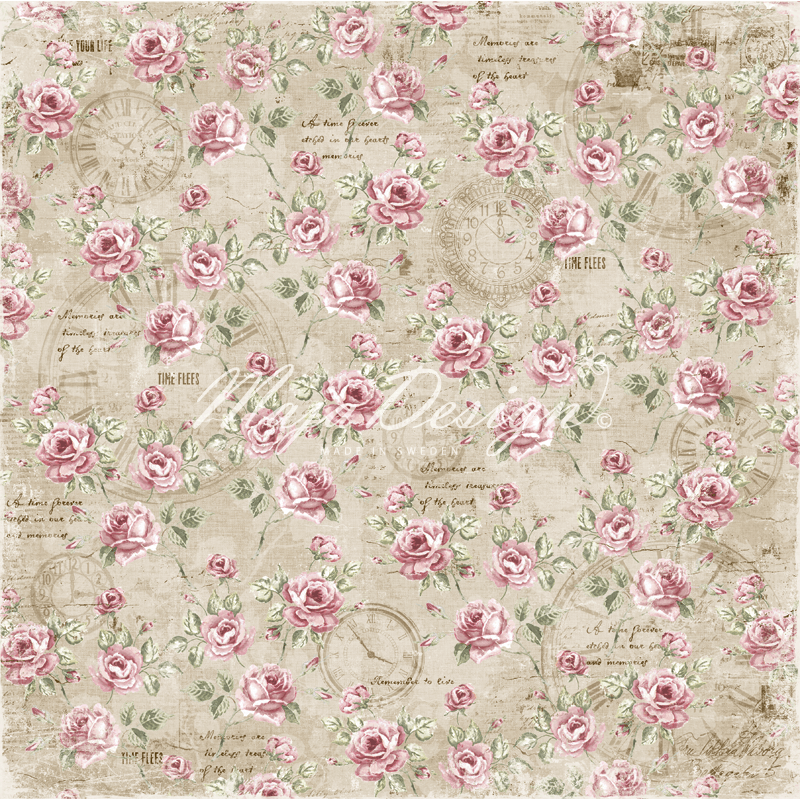 And I found this in the Vintage Autumn Basics No. 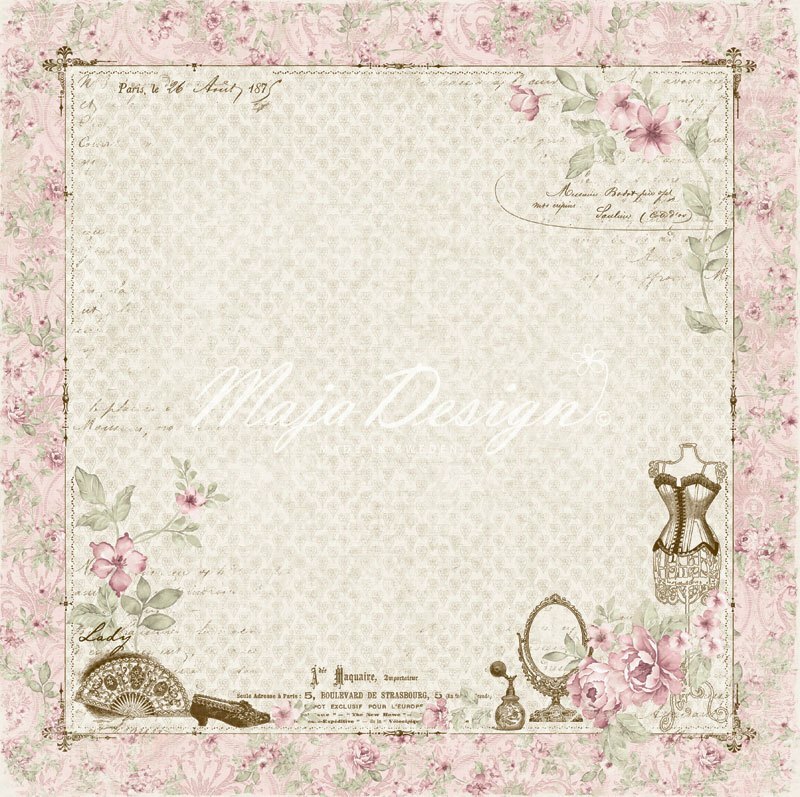 II sheet that was in my gorgeous Maja stash. I have cut at least a half of this sheet up and layered it in and around the page. 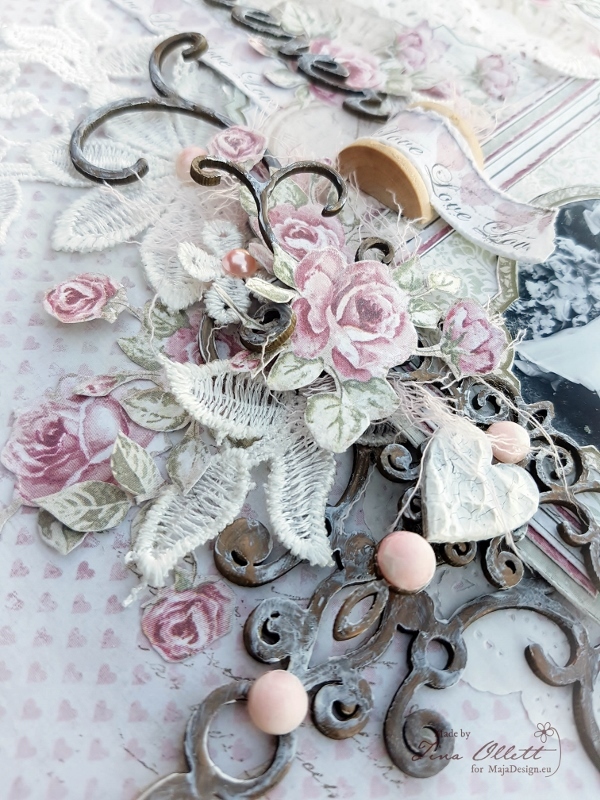 You can see above in the bottom of the photo the layering of journalling cards that I cut from Vintage Spring Basics “Days to Remember” and also from the Vintage Romance collections “Love Notes”. 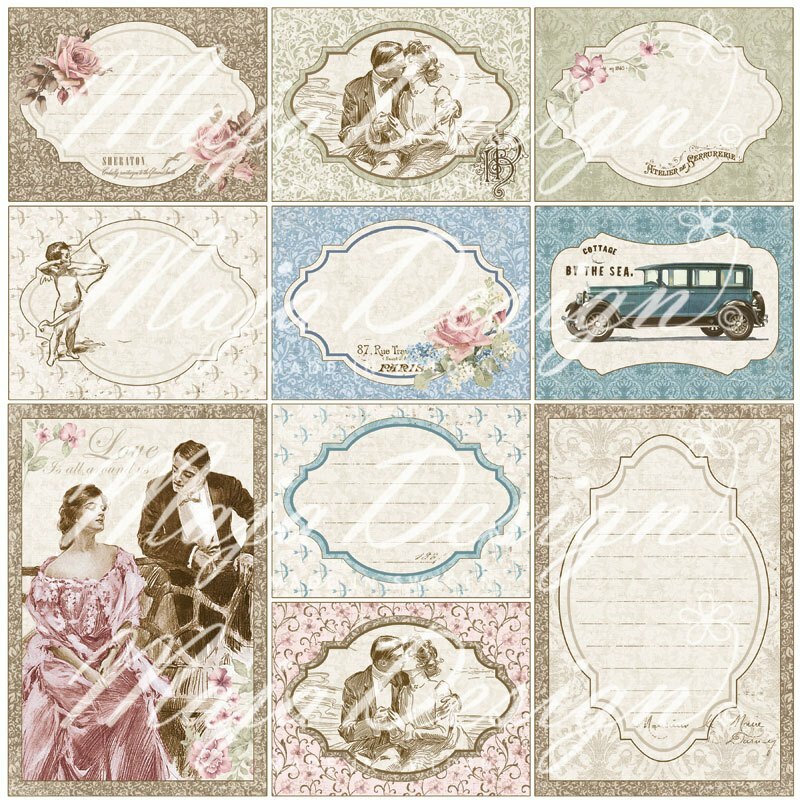 Amongst the several layers of journal cards I have alternated mats of “Raspberry Jam Cookies” from the Coffee in the Arbour collection. Yes I have mixed a lot of collections this time around . 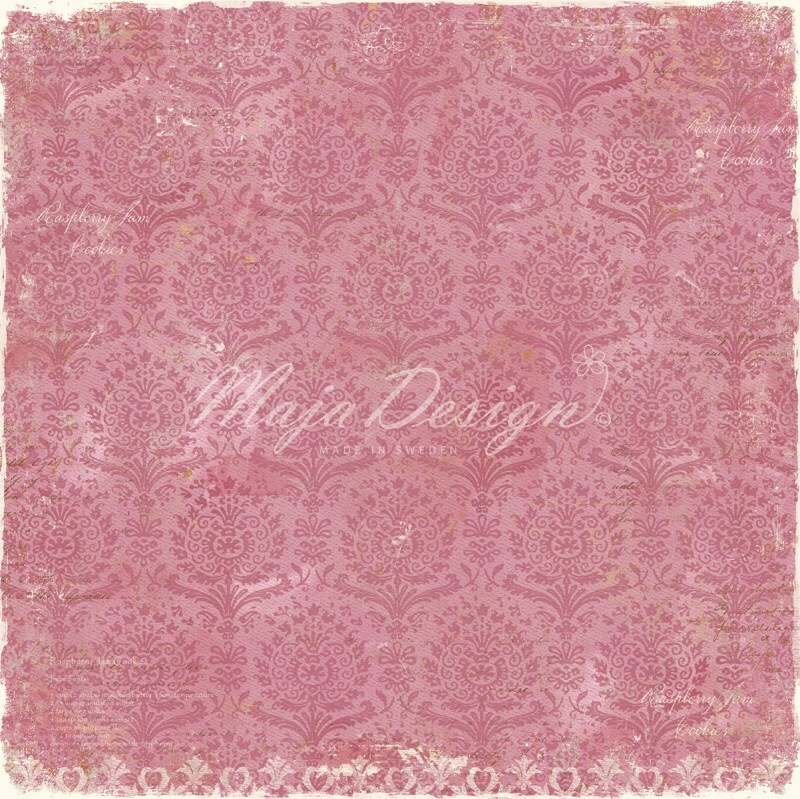 I find the beauty of Maja Designs ranges is that they just blend together so beautifully. 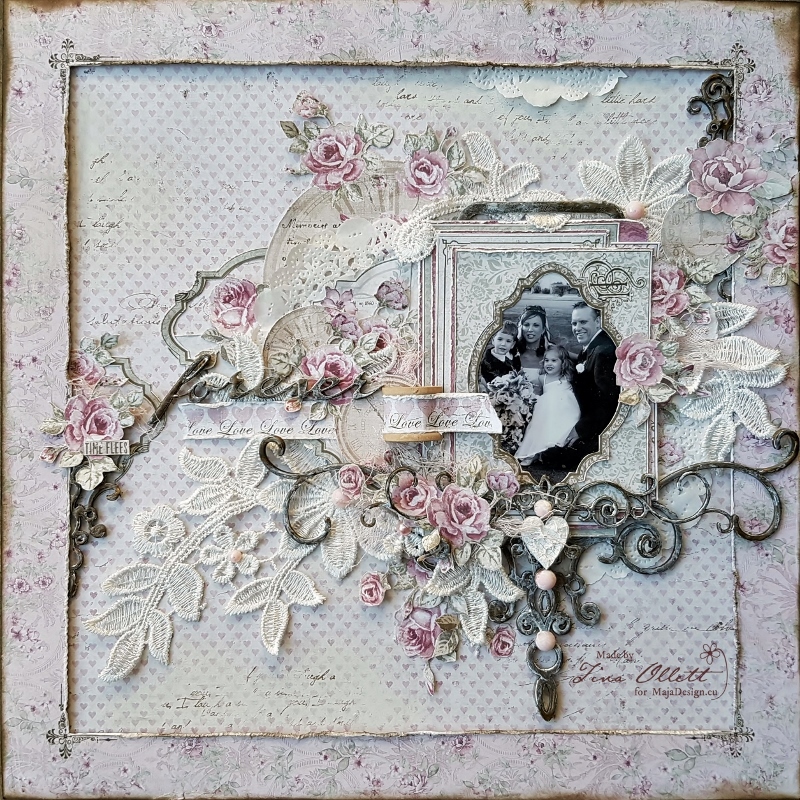 I have layered the project with paper doilies, lace motifs, Dusty Attic’s gorgeous chipboards cut up, muslin and even a sewing spool. 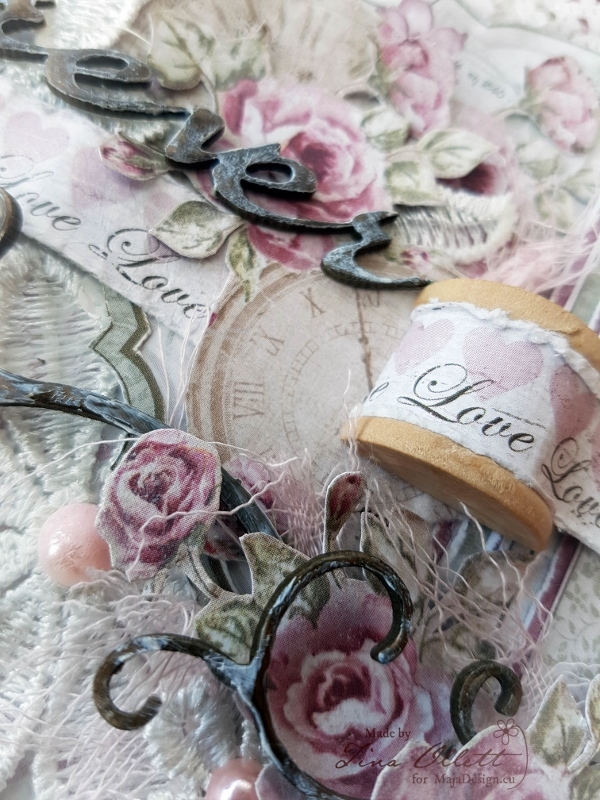 The sewing spool was wrapped with the bar strip from Vintage Romance’s bside of “Passion”. 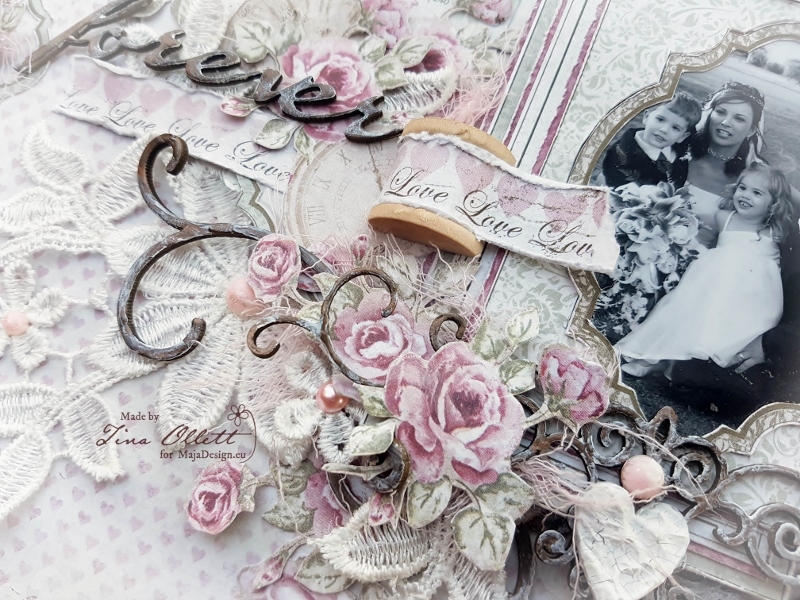 Passion was used as my background piece with the frame cut from Vintage Romance’s “She’s my Lady”. This here, is the side on view of the base of the photo. 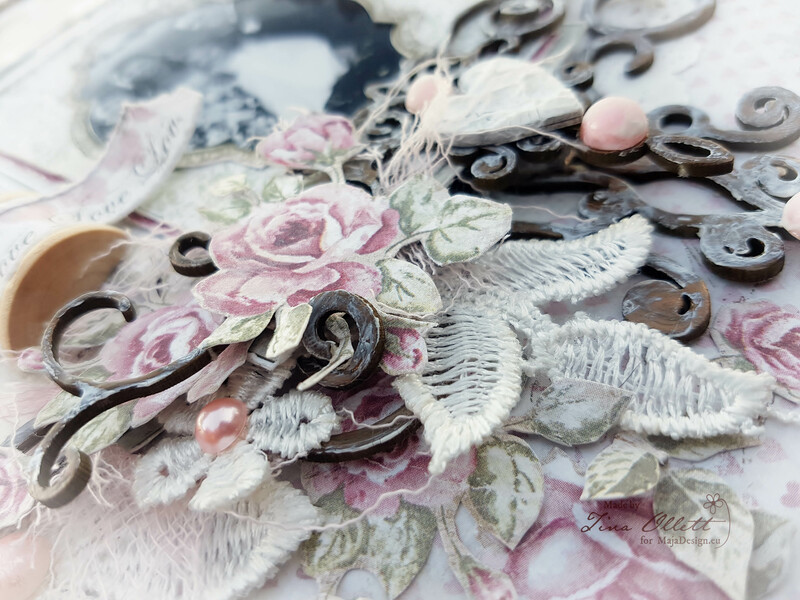 The lace motif I have used here has been cut into many many pieces and divided throughout the layout to help give it movement. I have tucked a few doilies around to help break up the pink from the flowers and the background. 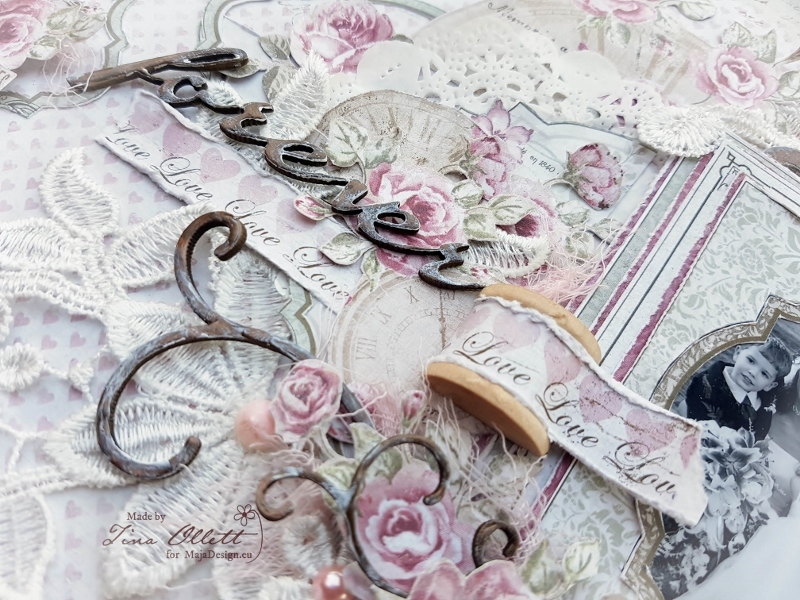 I just loved these clocks found on the Vintage Spring Basics sheet. I have used the largest of the clocks and cut it to sit behind the photo so it did not overtake the whole layout. I cut some of the smaller clocks with the roses to sit on top of the large one layered. I so hope that you have enjoyed your time here today. 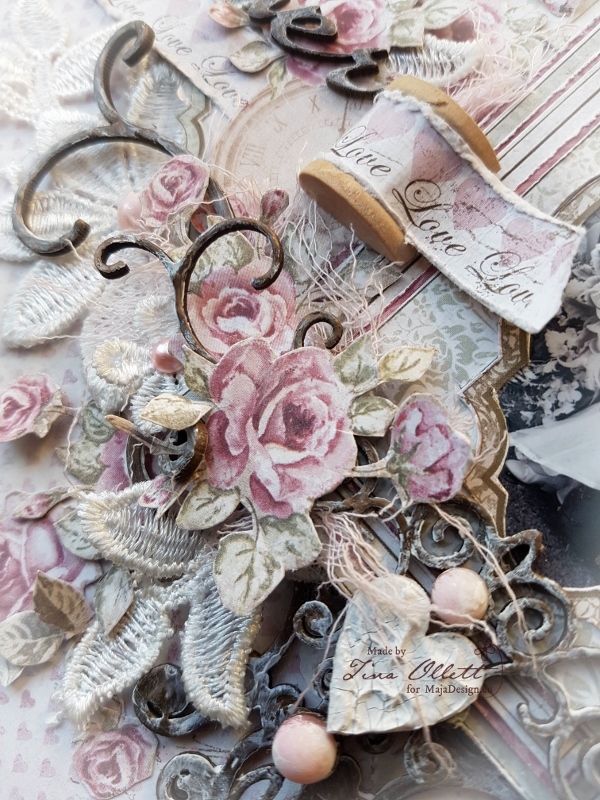 If you have pieces of different Maja collections lying around in your stash, why not try combining them together like I have here today. Would love to see what you do! Until next time take care and happy scrapping. Oh my goodness this is absolutely Gorgeous!! Love every carefully placed piece on this layout. It’s so romantic and brimming with softness. Your memories and love of this day shines through your detailed work. Very inspiring. Been kind of having post year blues you might say and this has lifted my spirits. Thank you Tina. This is sooo sooo beautiful Tina, and I´m totally overwhelmed with love and joy just by looking at it here. 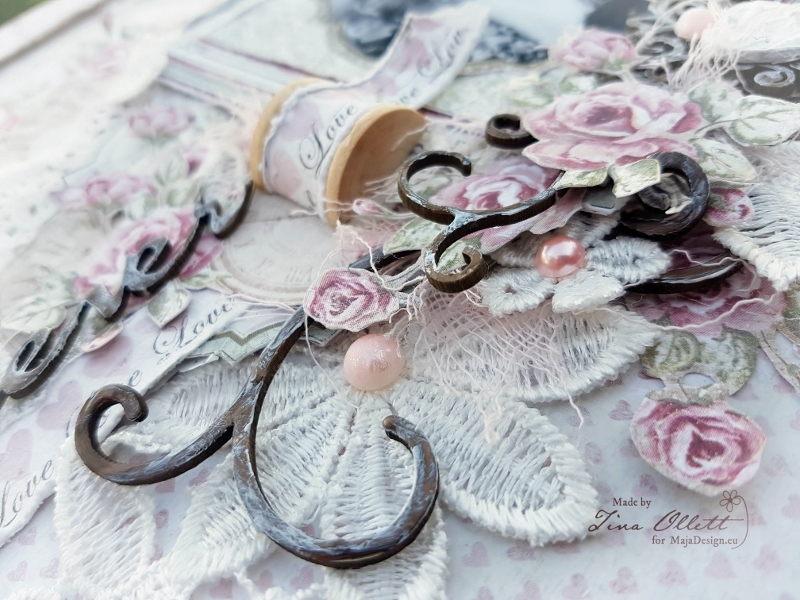 You really made a masterpiece here that shows how gorgeous these papers can be used. I love it. What a beautiful way you have given me to start my day. Your story makes the layout so much more meaningful. Thank you for sharing.